Today’s guest post is written by AmeriCorps alum Joel Smith. Joel served in AmeriCorps NCCC Class XIII in 2007 with his team Water 4. He is also the writer of a graphic novel, The Parish: An AmeriCorps Story, about serving in New Orleans that he first spoke with us about in 2012. 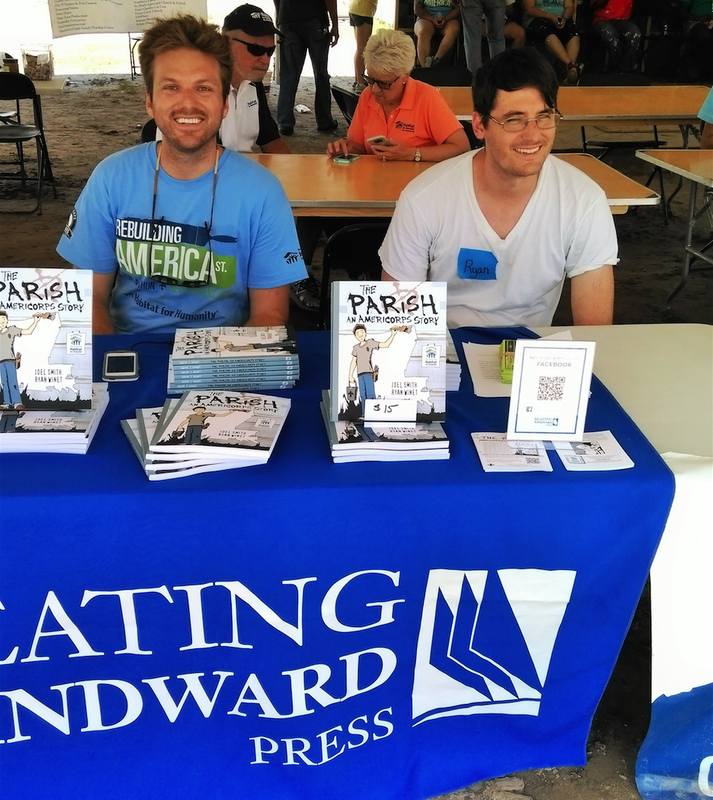 This May, Joel celebrated the release of his book and commemorated the 10th anniversary of Hurricane Katrina by returning to St. Bernard Parish for Habitat for Humanity’s Build-A-Thon. 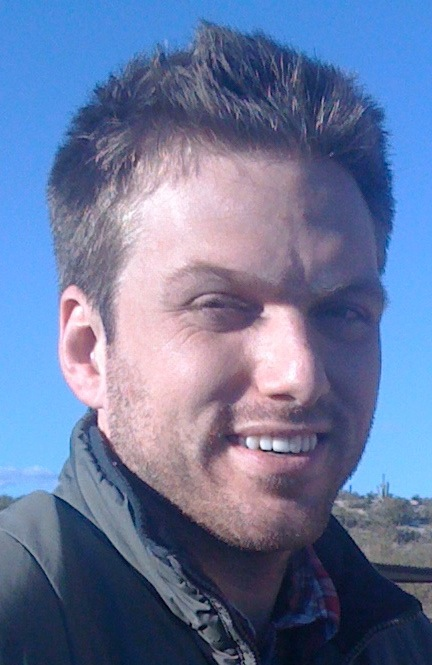 Joel currently works as an English Lecturer at the University of Arizona and as the Fiction Editor for Spork Press. 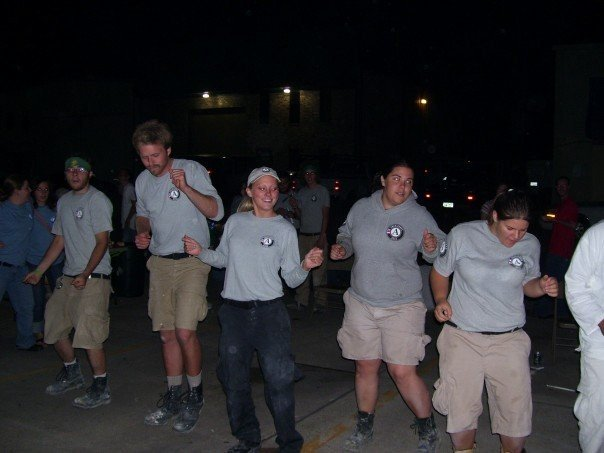 Our team dancing the “Cupid Shuffle” at a St. Bernard Project BBQ, if memory serves. In 2007, I was lucky enough to be a member of AmeriCorps NCCC Class XIII. My team was based out of Denver, CO, and our first spike was in Beaumont, TX with Habitat for Humanity. Back then, all campuses sent teams to the Gulf Coast to help rebuild after Hurricanes Katrina and Rita. For our second round, our team moved into Camp Hope, an abandoned elementary school in St. Bernard Parish, LA. Again, we worked with Habitat for Humanity, and the two months we spent there changed my life forever. St. Bernard Parish was an unforgettable place, a ghost town coming back to life, and I became possessed by the need to tell its story. I was no local, so I took the point-of-view of NCCC members like me. The act of writing ignited a spark in me, and I later pursued an MFA in Creative Writing at the University of Arizona, where I now teach English. Eight years later, my first book, The Parish: An AmeriCorps Story is coming out. A few days before June 1st, the first day of hurricane season, I returned to NOLA to celebrate the release of my debut graphic novel.I wasn’t just there to sell copies; I came to participate in the Katrina Anniversary Build-a-Thon. 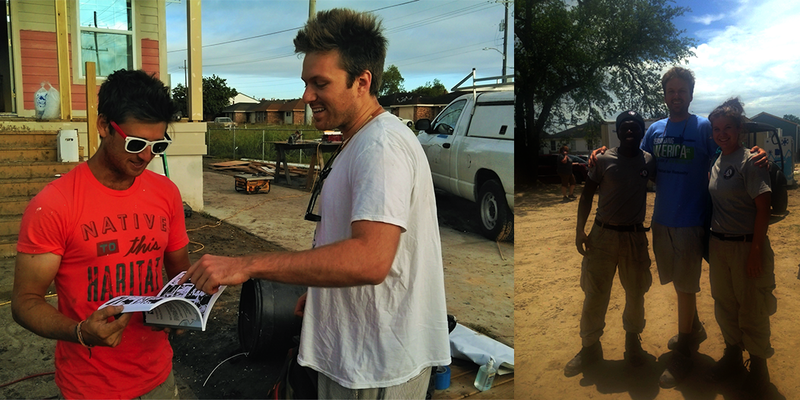 Habitat and AmeriCorps were partnering up to build 10 houses in 10 days to commemorate the 10th anniversary of Hurricane Katrina, and I had to be there. 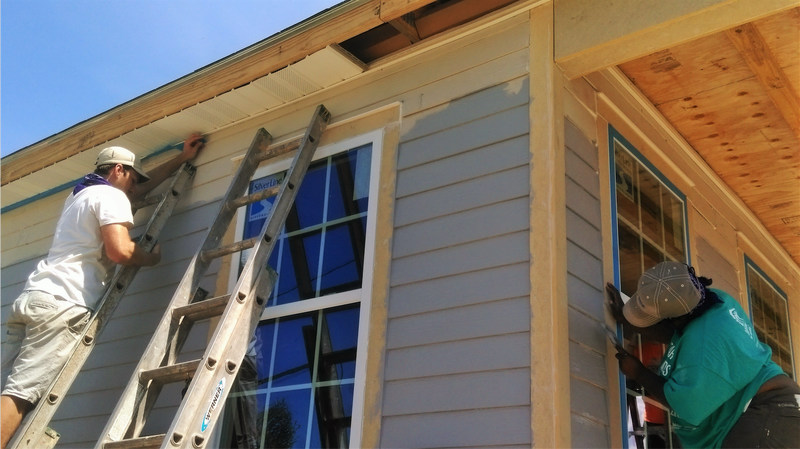 Here’s me at the Build-a-Thon, painting a house on America St. & Selma St. with Meriem, an AmeriCorps alum and Habitat employee in the Dallas area. At the Build-a-Thon, I reconnected with old friends I hadn’t seen since the Camp Hope days, and also met new ones, current NCCC members looking to get things done. Left: Joel with NCCC teammate Aaron Frumin who started the nonprofit Uncommon Construction. Right: Joel with Lo and Tori. After NCC, Lo wants to go to culinary school and Tori is thinking of starting an animal shelter. The day after the Build-a-Thon dedication ceremony, I drove out to St. Bernard for the first time since my gray-shirt days. I wanted to see what had changed, and what still resembled the fictional version my illustrator Ryan and I had created in The Parish. 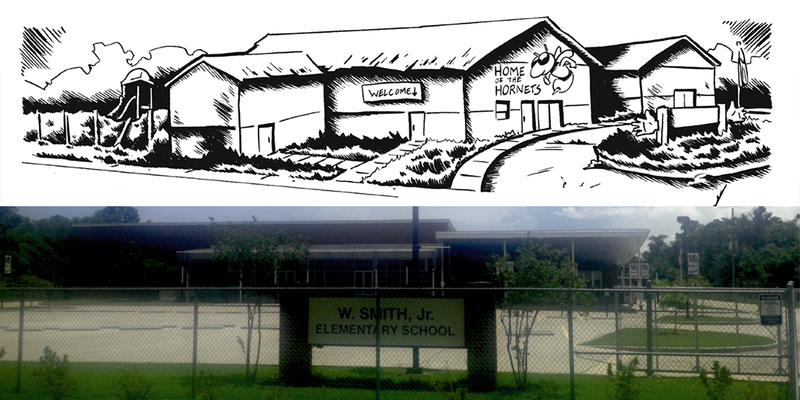 The original Camp Hope (aka Camp Believe in the novel) has been replaced by a brand-new elementary school! Back in 2007, the courthouse was almost demolished. Now, it’s looking better than ever. My illustrator Ryan and I at Build-a-Thon. As a writer and educator at the University of Arizona, where I’ve taught writing to hundreds of college students, I believe in the transformative potential of words and ideas. Although I didn’t join NCCC to become a writer, it allowed me to travel the country and get to know people through service. In doing so, I got to know myself. 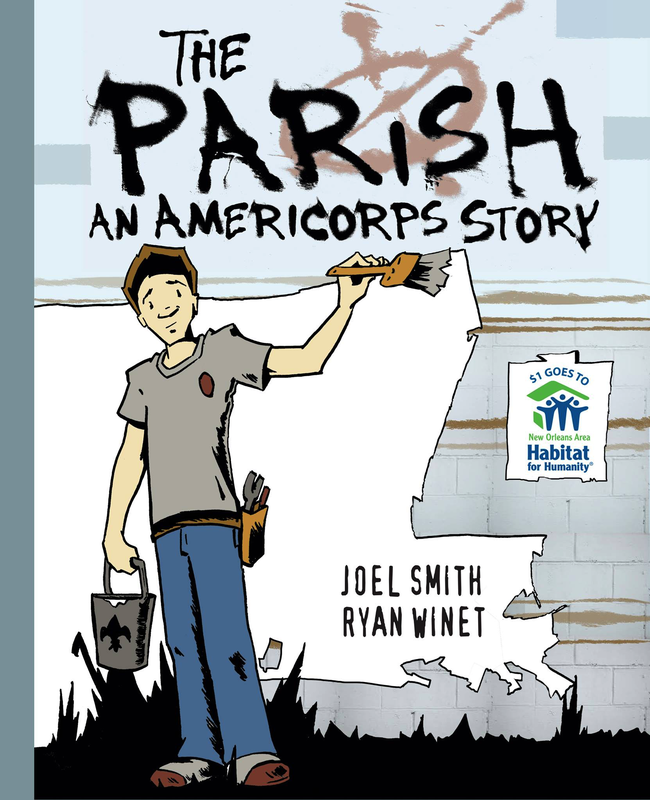 For more on The Parish: An AmeriCorps Story, please visit parishcomic.com or Beating Windward Press. In the spirit of AmeriCorps NCCC and getting things done, we’re donating $1 from each copy sold to the New Orleans Area Habitat for Humanity. ← You Can Change the World in 5 Hours. Here’s How.